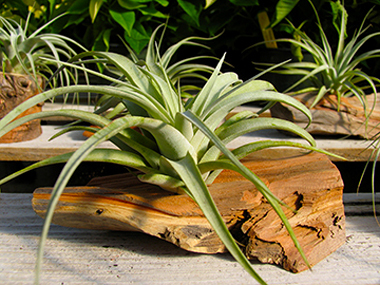 Tillandsia are nicknamed “air plants” because they need no soil! Their roots are used only as anchors because they absorb water and nutrients through their leaves. These decorative, visually fascinating and hardy members of the bromeliad family are native to the Americas and found in deserts as well as tropical rain forests. They grow natively in places from sea level to high-mountain regions. The most important thing they need is bright, filtered sunlight and regular watering. While they should not be kept continuously wet, they do need to be soaked at least once a week for about an hour, and misted when the air is dry. 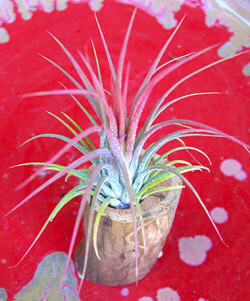 Tillandsia do best in moderate temperatures between 50° and 90° but can tolerate up to 100° F if watered or soaked to replenish water loss. 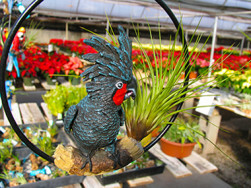 They are sensitive to frost, but can survive temperatures as low as about 36° F.
Regular fertilizing is recommended, using a high-quality water-soluble fertilizer diluted to one-fourth of the regular strength.